Cody Gann on Hevvy Metal. Seth Petit Photography. Cody Gann, Leighton, Ala., scored 218.5 points on Sunday, riding Hevvy Metal, to win the NCHA Eastern Nationals Junior Youth championship. Ryleigh Ferrier, Aubrey, Tex., earned the reserve championship with 215.5 points aboard James One Five, while Gavin Mesalam, Versailles, Ky., placed third with 215 points on Stylish Import. Cody Gann has made his mark in Junior Youth competition over the past two years. He was a 2017 finalist in the NCHA Denver Nationals Junior Youth riding Defiant Cat, as well as an NYCHA Youth Scholarship finalist in 2017 with Hes A Heapinspoonful and in 2018 on My Pepto Jewels. Last year, Cody placed second with Hevvy Metal in the finals of the $2,000 Limited Rider, at The Non-Pro Cutting,. Nine-year-old gelding Hevvy Metal LTE $143,002, by Metallic Cat, was a successful limited-age event competitor with trainer Todd Gann, who showed him to win the 2016 Congress Futurity Open Classic and to place as reserve champion of the Southern Futurity Open Classic. Todd Gann has also shown Hevvy Metal as an Open finalist at the Eastern Nationals, including this year, where he placed fifth. Ryleigh Ferrier on James One Five. Seth Petit Photography. Ryleigh Ferrier won last year’s Eastern Nationals $15,000 Amateur aboard the Cat Ichi gelding Ichi City Limits LTE $23,356, the horse she also rode to win the 2017 Eastern Nationals Junior Youth championship, and to place in the finals of five other events. 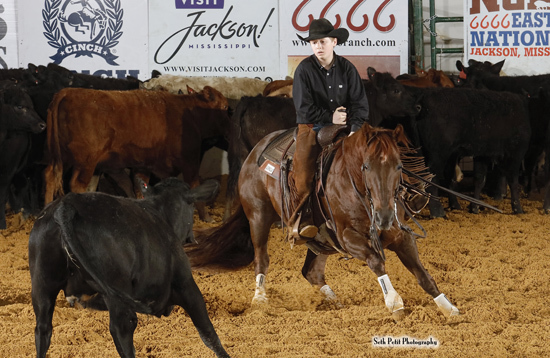 James One Five, Ferrier’s 2019 mount, is owned by Billy and Rosemary Atwood, Weatherford, Tex. 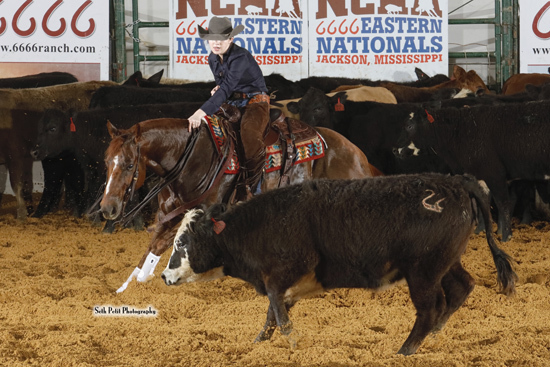 The 5-year-old High Brow CD gelding was a 2017 NCHA Futurity Amateur Unlimited finalist with Billy Atwood, as well as a 2018 NCHA Derby Amateur Unlimited finalist. Gavin Mesalam made his very first finals performances count, with his third-place showing in the 2019 Eastern Nationals Junior Youth, as well as eleventh-place in the $2,000 Limited Rider. His horse, 10-year-old Stylish Player LTE $49,703, by Lizzys Gotta Player, was a successful open and non-pro limited-age events finalist with Steve Oehlhof and Missy Etheridge. Gavin’s parent, Randy and Sabrina Mesalam, purchased Stylish Import from Etheridge in the 2017 NCHA Futurity Sales.